~It's snowing. I choose to ignore and turn on the fire place because it's beautiful to look at, but I swear--this better be the last time until November I turn it on! ~We are looking for a new car. Preferably a Hyundai. With low miles. At an amazing price. And black..because every one knows black cars are way cooler. 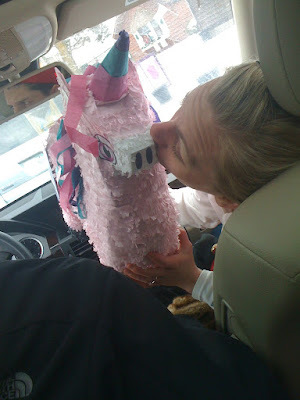 ~I went to Nisswa with a client friend on Saturday and we found Charlie the unicorn! He is splendid. In honor of Charlie, and just for giggles, I leave you with the stupidest yet most hilarious video--possibly ever.